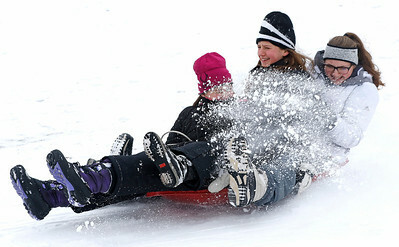 H. Rick Bamman - hbamman@shawmedia.com Enjoying President's Day off students from left, Emerson and Olivia Dyja (cq) and Jackie Mavel enjoy a ride down the sledding hill at Veteran Acres Park in Crystal Lake on Monday, Feb. 15, 2016. There is a chance of snow on Tuesday with a high near 35 degrees. Temperatures in the 50's are expected near the end of the week.